If you are reading this, for full effect you should read the rest of this post in a high pitch squeaky voice. Jumping up and down and waving your arms! Here goes.... 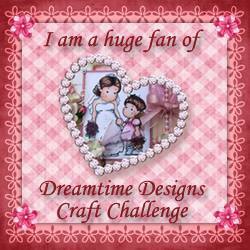 I have made it onto the absolutely fantastic DreamTime Designs DT!! Well it was one of those applications you put in, just with the highest of hopes, I never thought I'd be picked by such a super talented artist such as Lisa herself! And now I'm lucky enough to be working alongside some equally talented DT ladies - i am on cloud 9 right bow and feel really challenged and ready to up my game! Hello Marina... I love your work girl..I am very excited to be on this journey with you..
Gorgeous post. Love it! Thanks so much & I am so proud to have you part of our team. I hope you enjoy :) Big hugs, Lisa. Congratulations to US!! I really look forward to working with you and building DDCC into something phenomenal. congrats to you sweetie I am so excited to be a part of this team with you and cant wait to see what Lisa has in store for us! !